You’ve created your dream patio or deck space and now you need to keep it covered and protected! The backyard experts at AJ Criss Industries can provide patio covers, gazebos and arbors to provide shade in your new landscape and to help protect your exterior furnishings from the elements. They also can create feature gazebos and arbors in your backyard oasis that add an extra element of glamour and design intrigue. 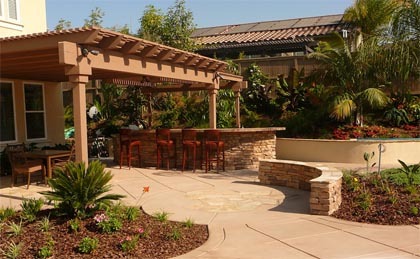 All of the patio covers, gazebos, and arbors created by AJ Criss Industries in San Diego are fully custom and created just for you. They use the highest quality materials and durable plastics to assure that your feature investment can withstand the test of time. Tested in various weather conditions, the patio covers, gazebos and arbors delivered by AJ Criss Industries are guaranteed to hold up in San Diego weather conditions. Including these features in your landscape design will help to keep you cool and shaded when it is hot and protected from the elements when it rains. If you are looking for a professional Escondido landscaper, then please call 760-489-5120 or complete our online request form.